OEM and compatible and remanufactured—oh my! Choosing a toner cartridge should not elicit Dorothy’s fear of lions and tigers and bears, though sorting through the options available today can be confusing. It is important to choose the right cartridge for your organization and avoid purchasing cartridges that could end up costing you more money. 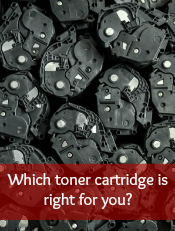 In this post, we hope to demystify the types of cartridges available and help you make a more educated choice the next time you need to order toner cartridges for your organization. Compatible toner cartridges are produced by third-party manufacturers. The toner cartridge is made from an OEM cartridge that has been returned or recycled. The compatible toner cartridge has been cleaned and a new virgin core and new drum have been inserted, just like the OEM cartridges. The compatible toner cartridges Copeco sells are also tested and ISO certified. Compatible toner cartridges have the same yield as OEM toner cartridges, but at a better price point. Those that we sell at Copeco are guaranteed 100% for up to one year after purchase. They are also tested and approved by the manufacturer, so you are guaranteed quality. Just like compatible toner cartridges, remanufactured toner cartridges can be purchased at a lower price point than OEM cartridges. It is hard to know what you are getting with a remanufactured toner cartridge or where it is coming from. While it may come with a lower price point, it may also come with lower quality as well. If you purchase a remanufactured toner cartridge that ends up being low quality and can’t produce the same yield, it could end up costing you more money in the long run. Compatible toner cartridges are a good middle ground between OEM and remanufactured cartridges. You are able to save money while still ensuring quality. Many compatible cartridges have a warranty, and you do not have to worry about inferior performance. As we stated before, make sure you are purchasing compatible cartridges from a company you trust. We hope we have given you the confidence to make the right toner cartridge decision for your office, but if you have questions about OEM, compatible or remanufactured cartridges, feel free to contact our supply department. We are happy to help you find the right one for your organization.